Order in next 14 hours and 3 minutes for despatch today. 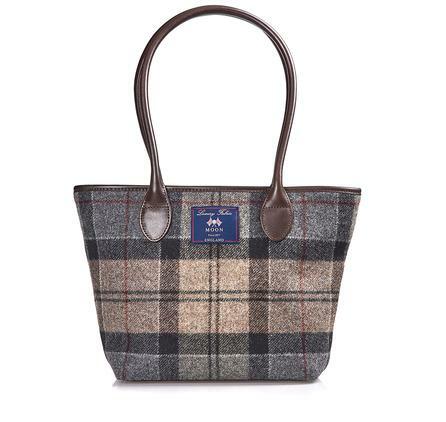 The Barbour Dee Tartan Handbag is a smart, sophisticated tote with a pure new wool outer in Barbour's iconic tartan. The wool is sourced from a traditional British woollen mill and beautifully complemented by a real leather trim. Make your choice of tartan from the pull down menu below.SALE! Barbour lambswool tartan scarf 59 inches by 12 inches (180 cm x 25 cm). Tasselled fringe at either end. Choose the tartan to go with the lining of your Barbour jacket, using the pull down menu below. The Ancient tartan for example, goes with the lining of the sage green Barbour jackets. There are 5 other tartans to choose from; Dress tartan for navy jackets Classic tartan for olive green jackets Modern and occasionally cardinal tartans for black jackets Muted tartan for rustic brown jackets There are now 3 new tartans; forest, black:grey and navy:red Made in Scotland. Would you like to check stock availability? Call Sara or Paul on 01494 775577 (if not from UK please call 0044 1494 775577) Mon-Sat 9.30 a.m. to 5.00p.m. Please Note: We do not accept orders by telephone and enquiries are better placed by email too. When ordering on-line, please note that we do not deduct any money from your credit card, until the goods are being despatched. Please also note that you may alter the quantity of goods in your basket at any time. T: 01494 775577 during working hours. Telephone 01494 775577 during working hours. Email sales@saddler.co.uk or telephone 01494 775577 during working hours.